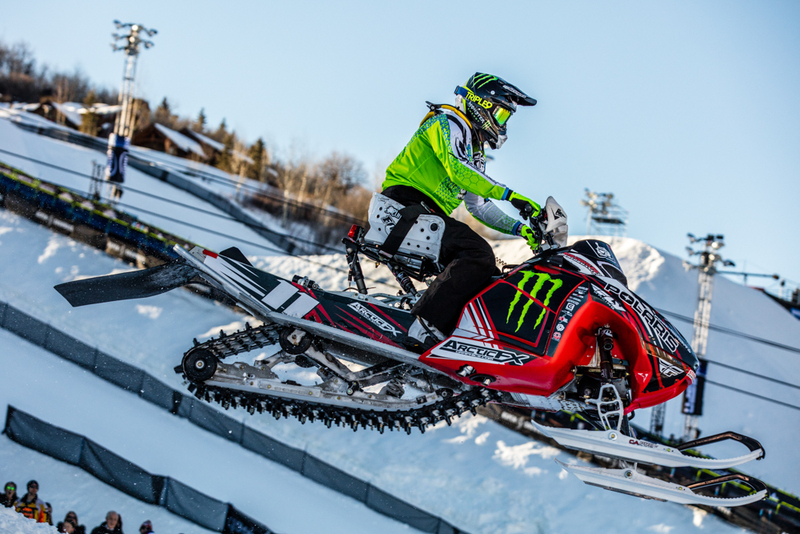 January 2016 - Midwest Sports Publishing Network, Inc.
ASPEN, Colo. – January 28, 2016 – Monster Energy congratulates Paul Thacker on his silver medal today at X Games Aspen 2016. After a tough final that included a big first-turn crash, he raced hard to earn his first-ever medal at X Games in nine appearances. The Adaptive Snocross event has been at X since 2010, taking a break in 2012. All of the racers have some sort of disability and employ special sleds and equipment to allow them to hit the track. This year’s Snocross course featured six turns and was full of tricky banks, a step-on step-off feature, and a huge 80-foot jump right before the finish line as an option for the racers. With perfect light and a freshly groomed track, the stage was set for a great battle. In the final, Thacker avoided a big three-snowmobile pileup right out of the gates to lock into a comfortable third position. He then went to work, eventually slipping into second place where he stayed thanks to smart racing and clearly fast riding. He crossed the finish to take the silver. Hailing from Anchorage, AK, Thacker is known as a hard charging rider with a great attitude and big sense of humor. In 2009, he became the first rider to jump a snowmobile the length of a football field, clearing 301 feet at 87 mph. An injury in 2010 didn’t slow Thacker down—he charged forward as hard as ever and continued training. Thacker now relies on a special custom seat with a shock absorber to hit the course. 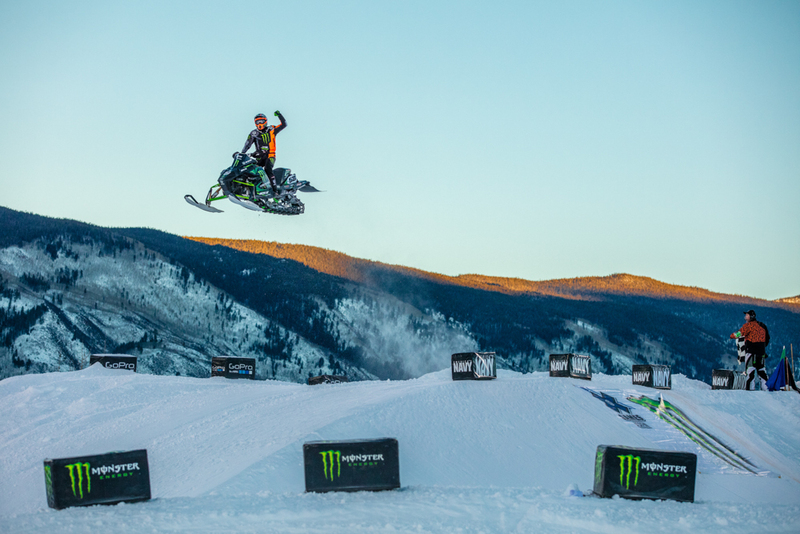 On top for a record nine years, dominance was once again the word to best describe Tucker Hibbert as he earned Gold in Monster Energy Snowmobile Snocross today at X Games Aspen 2016. It was all Hibbert all day as he easily won his semifinals race before owning the finals, bagging his record-setting ninth-straight Gold in the event, and tenth gold overall. With today’s win, he’s now tied for the most consecutive golds in a single discipline, matching the record set by his Monster Energy teammate, Jamie Bestwick, who has nine golds in BMX Vert. This year’s Snocross course was full of tricky banks, a step-on step-off feature, and a huge 80-foot jump right before the finish line, sending racers sailing about 100 feet as they cleared the jump. A slightly tracked-out course and a setting sun meant slightly more challenge for the racers today. Dominant from the get-go, in the finals Hibbert controlled the first corner from the inside, taking the immediate lead. The #68 Monster Energy sled was running clean and fast, and true to form Hibbert took that early lead and ran with it. Where the rest of the field needed to check before jumps, slow down, and run cautiously in certain zones, Hibbert displayed his ability to keep the throttle pinned and maintained tons of momentum throughout every turn. The rest of the field needed Hibbert to make a mistake if they had a chance to ruin Hibbert’s nine-peat hopes, but that mistake never came. Hibbert stayed consistent and strong, constantly stretching his lead over 20 laps until the checkered flag flew. He was ahead by over 10 seconds by the end of it all. More than just the man to beat, Hibbert is regarded as one of the best snowmobile racers in the world and has been nothing short of dominant for the last nine years. After taking gold as a young 15-year-old in 2000, he rebuilt over the next few years before beginning his unprecedented winning streak. 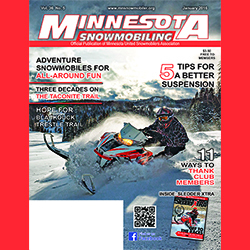 A rider that’s simply used to winning, from his diet and his workout regimen to the perfect set up of his sled, the Minnesota-resident is a classic hard worker with the talent to match. (January 27, 2016) – After racing last weekend at the Wausau 525 Snowmobile Championship, Rounds 4 and 5 of the TLR Cup Tour are in the books. The state of the art, purpose-built track played host to racers all in the running for series points as the 2016 race season hits the midway mark. A fan favorite as well, the grounds swelled with spectators’ eager to hear the roar of race engines and watch drivers race side by side through wide corners. Pro Champ drivers were able to practice on Friday night before time trials kicked-off the day of racing on Saturday. Cardell Potter posted the fast time and went on to go undefeated throughout qualifying, as did fellow Ski-Doo drivers Gunnar Sterne and Matt Schulz. Travis MacDonald (Ski-Doo) and Blaine Stephenson (Polaris) also showed promise by taking runner-up finishes in both of their qualifying heats. In the feature, Schulz was able to fight off Potter and Sterne, both of whom were making hard charges for position. The race would end with the top three finishing in that order. After qualifying rounds on Sunday, it was Sterne who came out atop the boards to earn the pole position, having won all three of his heat races. He went on to lead a large portion of the feature until eventually Potter made a pass for the win, with Schulz rounding out the top three. This weekend was not the first that the three shared the podium and it is no coincidence that they’re also on top of the TLR points chart. As the green flag lifted for the TLR #2 Super Mod 440 final, it was truly anyone’s race after several drivers won their heat races. Jacob Goede held the lead and began to celebrate victory after lap five, unaware that he was actually competing in a seven-lap feature. His brother Matt, driver of the #28 Polaris (pictured below), seized the opportunity to pass and won the race before Jacob was able to catch-up. He would finish second, with Paul Diefenthaler taking third. Justin Ernst raced to the win in TLR #3 Super Mod FA/LQ, with Jim Zierden and Bill Stull claiming the remaining top spots, in that order. Shane Peterson made his first appearance of the season in winning form as he took the checkered flag in TLR #4 Super Stock 340 FA/LQ, followed by Kyle Nouis and Clinton Guminey, respectively. When the TLR #5 Outlaw 600 class hits the ice, you never know who will come out in the lead. Bob Richardson took the win during Saturday’s feature but was bested by the #65 of Trever Spokely when TLR points were on the line Sunday. Rounds 6 and 7 of the Tour will take place this Friday and Saturday at the Alexandria Winter Spectacular in Alexandria, Minnesota. Like TLR Cup Tour on Facebook for live updates all weekend! 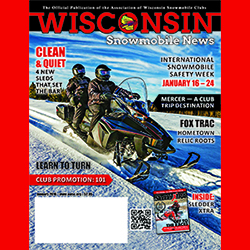 Plymouth, Minn. (Jan. 26, 2016) – Team Arctic raced through the mid-point of the 2016 cross-country and snocross season at full-throttle and without looking back, collecting more wins and more podiums at the national events in Thief River Falls, Minn., and Deadwood, SD. 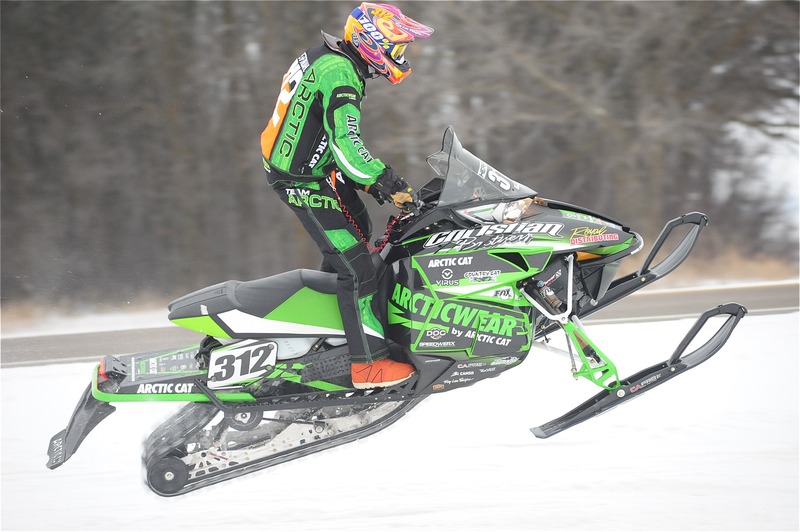 At the rough and rugged USXC Thief River Falls 250 cross-country, Team Arctic delivered yet another epic performance in which they captured 17 wins (out of 21 classes), 46 out of 63 podium positions and 1-2-3 finish in the premier Pro 600 class aboard Arctic Cat ZR 6000R XC race sleds with the 6000-Series C-TEC2 engine. Team Arctics Zach Herfindahl wins Pro 600 at TRF 300. Zach Herfindahl scored his second win in as many weeks, overcoming teammate and race leader Wes Selby with 10 miles remaining in the 2-day, 250-mile race to win Pro 600. Cody Kallock finished third for a Team Green podium sweep and perhaps a bit of foreshadowing for the upcoming I-500 XC. Other class winners included Ryan Trout, Jolene Bute, Brandon Wolter, Chad Lian, Matt Feil, David Brown, Ryan Wiedemann, Garet Grzadzielewski, Lydia Sobeck, Paul Brown, Dylan Herman, and the Mattison Racing brothers James, Mike and Gerry. 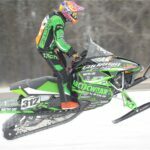 It was a similar beating of the competition at the ISOC National snocross in Deadwood, where Team Green captured 8 wins in 16 finals, plus 22 of 48 podium places. Tucker Hibbert added to his legend with a pair of come-from-behind wins in Pro Open, while Team Arctic teammate Jake Scott added more green to the Pro Open podium with an impressive third-place. Other Team Arctic class winners at Deadwood included Joachim Olsen, Ryley Bester (who is undefeated in both Junior classes this season), Eric Downs, Taven Woodie and Drew Freeland. Click here for more information on the next ISOC snocross national Feb. 5-6 in Salamanca, NY. Click here for more information on the next USXC cross-country on Jan. 30-31 in Park Rapids, Minn.